Here at Sumak Kawsay Yachay (SKY) we have been able to accomplish many things with the help of hundreds of volunteers from all over the world who believe what we do is a worthwhile project. The volunteers come to Ecuador in order to make a difference and to experience the unique culture of the indigenous community of Salasaka. In return, the people and children of Salasaka get to learn about other cultures and countries in a very personal way - something completely different than reading a few paragraphs in a textbook. There is no minimum time period required to stay and work with us. Some volunteers are here for a week, others for six months or longer. We want you to enjoy all of your time here. As soon as you feel it is time for you to leave, we will support you in that decision. As the project depends solely on volunteers, it is important to have long-term volunteers (six months plus). This includes the job as volunteer coordinator. It is very important that all volunteers can be self-reliant and help out wherever needed. Since Robert´s death, the project continues to be in a phase of reorganisation. Therefore, now more than ever, we need motivated volunteers who bring positivity and innovative ideas for our project. We ask volunteers to work a minimum of seven hours a day, Monday through Friday. A normal day starts at 8 in the morning with breakfast. Afterwards we have time to prepare classes, organize and maintain the house and garden. At 1pm we have lunch and then there are afternoon lessons with the children of Salasaka (from 2:30 to 7:00pm). In the evening, we cook and eat dinner together at the volunteer house. Most volunteers use the weekends to travel around this beautiful and captivating country. Salasaka is close to the spa town of Baños and is a day trip away from Quito, the beautiful lagoon of Quilotoa and the volcanoes Chimborazo and Cotopaxi. Since the project is run by volunteers, it is very important to have long-term volunteers for the volunteer coordination position. For more information, feel free to write us! Monday to Friday we provide 3 meals (breakfast, lunch and dinner) for the volunteers. We cook our meals ourselves according to our budget and ideas. Depending on the amount of volunteers you will have to cook one or two times a week. We have just moved back to our old home and are in the process of reorganizing the house. For the moment we have 3 dorm rooms, a big living room and a fully equipped kitchen. We look forward to getting more rooms soon. There are three bathrooms and one shower (hot water available). Wi-Fi is available in the volunteer house and we have blankets, sheets and a hammock. Unlike most other volunteer programs, we do not charge you to come and work for free. Our work here in Salasaka is not funded by any external organizations, and without the help of our volunteers and donors we would cease to exist. Therefore, we ask for a very modest donation of $30 per week, to help us cover our expenses. If you are staying with us for less than two weeks, we ask you to pay a rate of $7.50 per night. We provide a room, Internet access and three meals a day (Monday to Friday). Anything extra you want to buy for your own comfort will generally be very cheap here in Ecuador (e.g. a meal at $ 2.00), as is travelling around the country ($ 3.50 to Quito, $ 0.75 to Baños) if you want to have adventures on the weekends. As Salasaka is an indigenous community, many cultural aspects will probably be different from your home country, or even most other places in Ecuador. There are no illegal drugs permitted at any time in the volunteer quarters. Smoking is permitted as long as it is not in front of the kids or inside the school or volunteer house. To get here from Quito, take any bus from Quito's southern terminal "Quitumbe" to Baños, and ask the driver to stop in Salasaka (approx. 3.5h). You will be dropped off in the center of Salasaka near the pedestrian bridge (el puente). 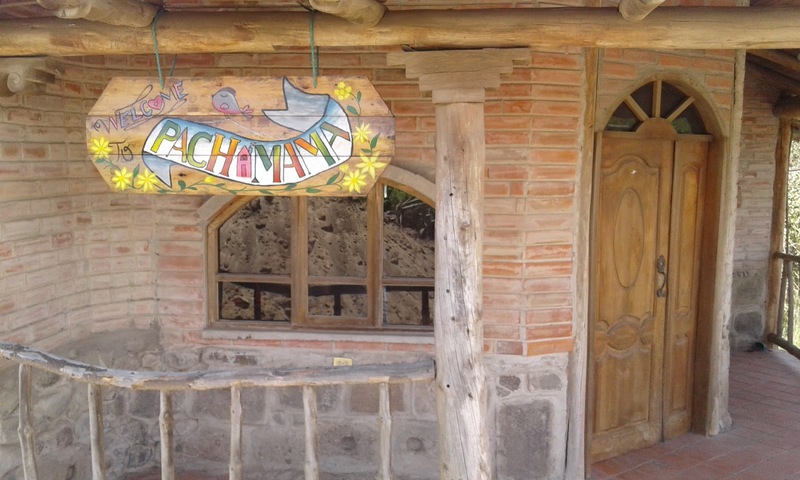 From there, take a camionetta (white pick-up truck with green stripe) to the volunteer house (known as "Hosteria Pachamama"). 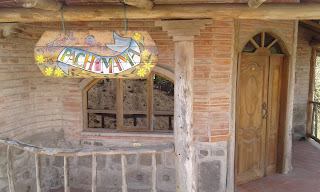 To get here from Baños, take a bus towards Ambato and ask to be dropped of in Salasaka. You will be dropped off in the city center near the pedestrian bridge (el puente). 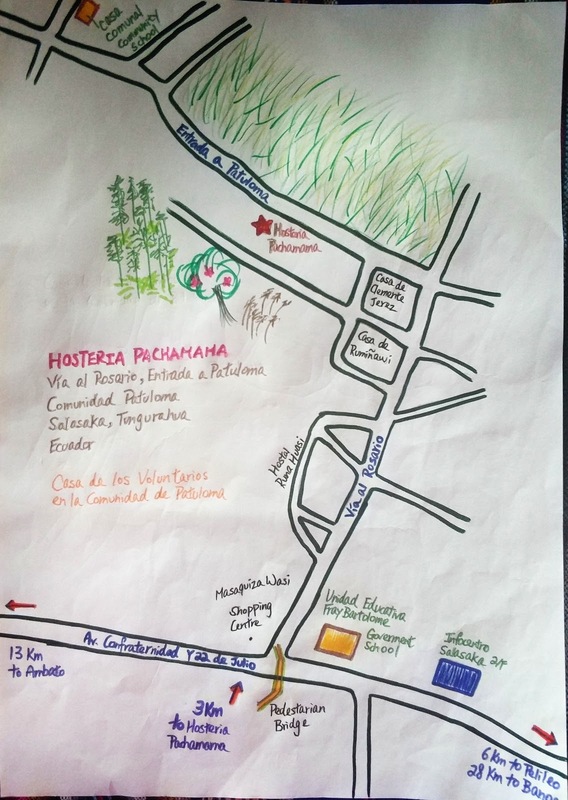 From there, take a camionetta (white pick-up truck with green stripe) to the volunteer house (known as "Hosteria Pachamama"). clothes: Lots of layers. The weather here is almost the same all year round, with cold nights, evenings and mornings. During the day the weather can change within minutes and as soon as the sun comes out it gets hot. Have a jacket or something that you can take off, a sweater for chilly moments and a t-shirt for hot times. Please complete our APPLICATION FORM and we will contact you shortly. For other questions write us an e-mail: volunteers.schedule@gmail.com. If you want to help us in other ways, please see our Support us page. All of the money that we spend comes from donations from around the world. If you think what we are doing here is worthwhile, please check out different ways how to support us or just use the button below to make a single donation.